Giri wins clash of the leaders vs Kramnik; Carlsen & Mamedyarov open their accounts. 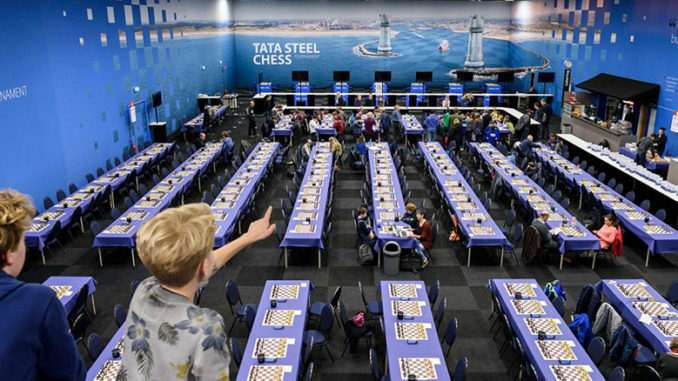 Round 2 of the Tata Steel Chess Tournament 2018, took place in Wijk aan Zee, the Netherlands on Sunday 14th January. There were two very exciting match-ups for me. The first being Magnus Carlsen playing Black against Baskiran Adhiban — Adhiban had almost beat the World Champion at this tournament last year of course. 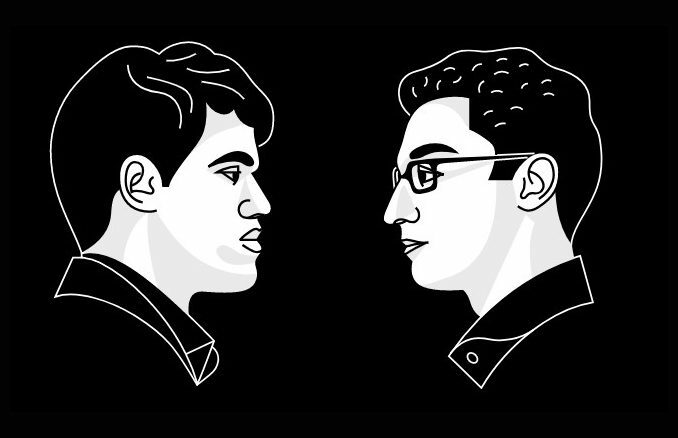 Elsewhere, winners of round one, Anish Giri and Vladimir Kramnik would also face off. 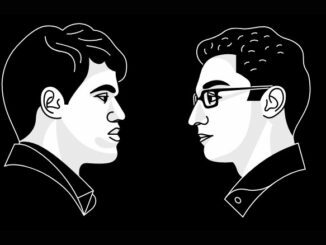 The game between Anish Giri and Vladimir Kramnik would produce the early leader of the tournament if decided and decided it was. Anish, playing White, chose the English Opening but the game transposed a little to take on something of a Queen’s Gambit Declined about it. Black equalised well out of the opening, but one could perhaps say that it was not one of Kramnik’s best games. The former World Champion made a couple of positional errors that are really not like him. The first was to give Giri access to his back rank via the a-file and this led to a serious advantage for the Dutchman. Errors and advantages are quantifiable, and it was clear that Giri was holding all the cards and in control of the game, but probably still had some work to do. However, this last fact was lessened dramatically when Kramnik offered the trade of Queens with 28…Nd7(?! see diagram, below). After 29.Bxe7 Nxb8, there followed 30.Bb4(!) and it was clear that the Russian’s rook was in trouble. And it was indeed claimed for the inadequate return of a knight. Resignation followed swiftly — not a good day at the office at all for Kramnik. And this gave Anish Giri the lead of the Masters Group at this stage, which will no doubt have gone down very well with the home crowd in Wijk aan Zee! At the opening ceremony of the tournament, on Friday, World Champion Magnus Carlsen, was asked a very interesting question. Well, I thought so anyway. He was asked, if given the choice, would he prefer to take a minus-one start and have all White games or plus-one and have all Black. Carlsen stated that he was not sure which of the two would give him most advantage, but that all Black games would be tough so he would take minus-one and have all White. “I usually start badly anyway,” he concluded. His round two game against Baskaran Adhiban, I suppose proved him right and wrong at the same time. Certainly, in Carlsen’s case, playing Black is not the outright disadvantage that many find in the world of chess mortals. Time and again, he has shown that he can play any opening and any colour and be a serious danger. This game was no exception and he would emerge the victor. Consequently, however, his tendency to start badly is out of the window. The game was a Scotch Four Knights, which one could say is not the most ambitious of openings should one wish to take it to Magnus Carlsen. Was Adhiban showing that he did not wish to take Carlsen on in theory? Well, if he was, who could blame him? In saying this, White did very well from the choice and was certainly in the plus for most of the game, though could not really undertake anything of substance. Then he started to lose his way a little. However, he chose 25.Bf3(?) which was answered strongly with 25…d4(!) This is much more effective after 25.Bf3 than it would have been after 25.c3, due to White’s bishop having been taken off of the c4-pawn and the d4-square being unchallenged. The balance had swung and Magnus had the bit firmly between his teeth. Disappointingly for Baskaran, his position quickly collapsed, Carlsen’s connected passers on the c-and-d-files were very strong and his bishop found its way to a6 in their support. In essence, the game was rather like a boxing match — White, having been perhaps ahead on points for most of the clash, let his guard down for one moment and received a knock-out blow. One just can not afford to do that against Magnus Carlsen. Together with Vishy Anand, Magnus has won five times in Wijk aan Zee. With this win, the quest for number six is off to a very good start! The other winner of this round was Shakhriyar Mamedyarov, who outplayed Hou Yifan with the Black pieces. He chose the French Defence to challenge her 1.e4 and really showed the power of this opening. His very fine strategic play gave him a commanding pair of knights, which enabled him to exchange his remaining rook for White’s last two minor pieces. From here, Black dominated and his strong passed pawn on a2 decided matters. The other games were drawn, but saw Gawain Jones having to fight for 69-moves to hold off Fabiano Caruana. The American will probably feel that he should have come away with the whole point. Yi Wei and Peter Svidler got into the marathon of the round. Their Grunfeld lasted 124-moves! Matlakov-So and Karjakin-Anand were fairly quiet. Jones, Gawain – Adhiban, Baskaran. Round two in the Challengers Group, saw two players who surrendered points in round one, bouncing back to reclaim them. Lucas van Foreest made his White game pay and recovered from defeat at the hands of his Brother, Jorden, to beat Junior World Champion, Aryan Tari. Elsewhere, Olga Girya defeated Matthias Bluebaum with Black. The other winner of the round was top seed Vidit Gujrathi. who took a point from Michal Krasenkow. There is a four-way tie at the top of the standings so far, with Gordievsky, Jorden van Foreest, Gujrathi and Korobov on 1.5/2.